It was quite busy week last week at the AQC in Melbourne, lots of lovely people to meet and some of the most amazing quilts on display. Unfortunately I couldn’t take pictures of all of them so I will tempt you with some of my favourites. There was a Quilt Challenge based on the theme of the Seven Deadly Sins. 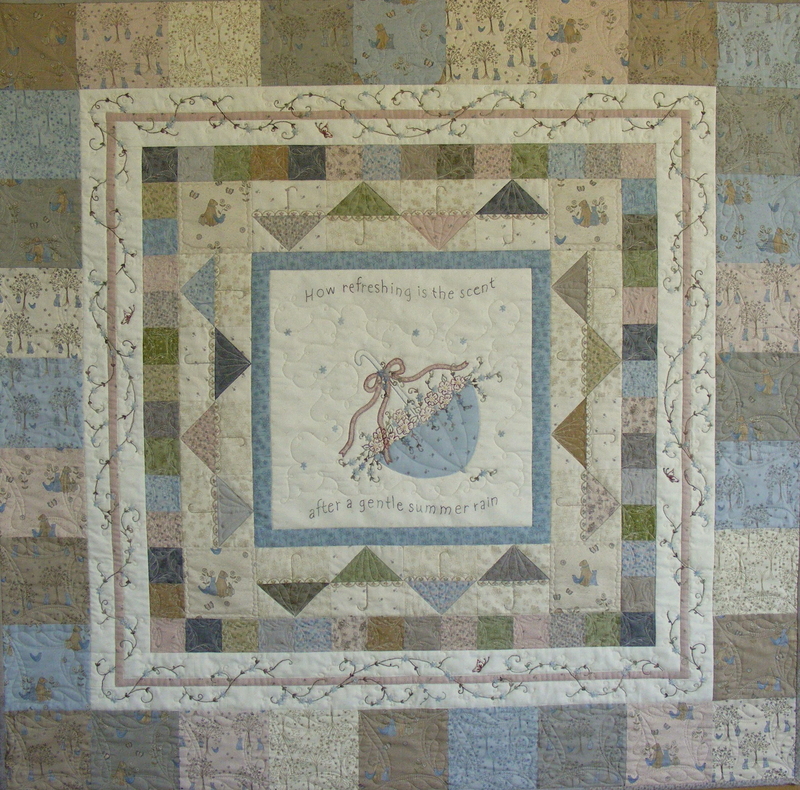 I have three quilt pictures depicting this theme. In my mind they are all winners and the creators of these wonderful pieces of art should be proud of their achievements. The hours of work that has been dedicated to these quilts also needs recognition. I met up with Melissa Grant of One Day in May working at The Patchwork Tea House stand who has kindly put a picture of my new quilt on her blog. Melissa is making the most gorgeous dimensional flowers on some of her projects, which I just love. Here is a picture of some of her work (taken from her blog post) as my picture didn’t work out as well. Hopefully you all have a safe and Happy Easter. Back at last ……. with a new project! Did someone remove March from the calendar? When I saw my last post was dated in February you could have knocked me over with a feather – surely it hasn’t been that long!! I knew that it had been a while since my last post as I have been extremely busy with all the boring things in life plus lots of other committments, but I won’t bore you with them. Here is the finished quilt (sorry missed the sneak peek) that I was working on using fabrics called “Summertime Friends” by Lynette Anderson. It has been such a joy working with her fabric range and I hope that you like the finished result. The quilt which I have called “Summer Rain” measures 45 inches square and makes a perfect lap quilt. The fabric has all of the soft muted hues that reminded me of slightly overcast days just before it rains, hence the name. 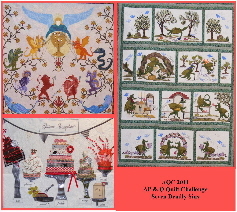 If you happen to be going to the Australasian Quilt Convention in Melbourne April 14-17 2011 you may just be able to have a peek at it on The Patchwork Tea House stand as the pattern will be available for sale. I am currently working on a Homespun project so I can’t show you a snippet at the moment and I have a few other projects coming up for retreats and also a project for Country Hart in Port Pirie in South Australia for their “My Sewing Room” Project of the Month. Why not pop on over & visit the website for more information. I hope that my next post isn’t too far away – I do tend to get sidetracked at the moment. Hope your weekend is relaxing with time for a little stitching pampering!! !